It’s almost Easter! Are you looking for fun holiday DIYs to do with your kids? Decorating Easter eggs is a festive tradition, but doing the same thing every year may get boring. 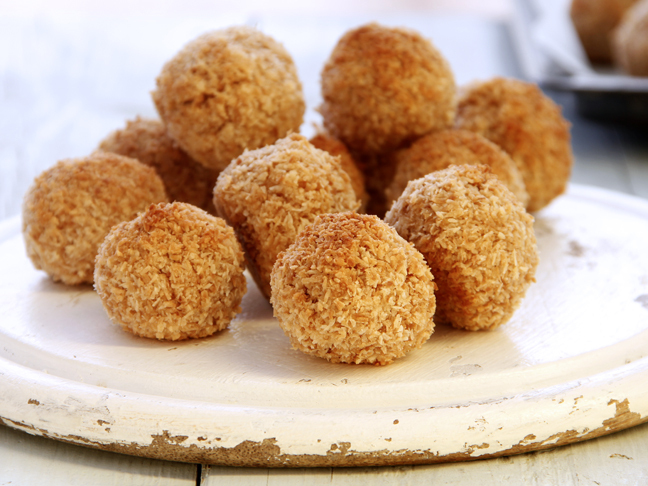 That’s why we came up with fun new ways to decorate your eggs this year. You don’t need store-bought kits— with a few simple materials, you can create baskets of unique Easter Eggs. Try these creative ideas! Color your Easter eggs with natural dyes derived from produce like beets, cabbage, and blueberries or from spices like cumin and tumeric. This will give your eggs the richests, deepest, and prettiest of Mother Nature’s hues. 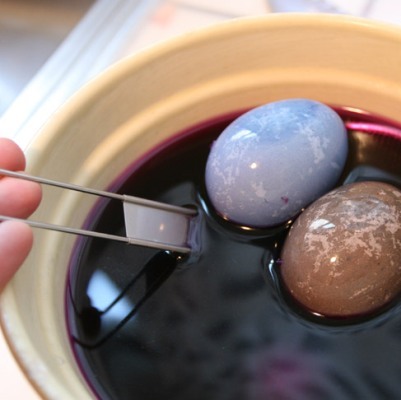 Learn more about dying Easter Eggs with natural dyes here and here. Deck your eggs with cheery Easter stickers. This is an Easter Egg decorating project any kid can do. Put out stickers of happy bunnies, or have your child simply stick shapes in any pattern she likes onto the egg to create a fun, freehand look! Before you drop your eggs in a dying ingredient, have the little ones scribble personalized messages, pictures or patterns onto the shells with crayons. The dye will pull away from the wax, giving it a one-of-a-kind motif; we made an egg with a polka-dot pattern, an egg with a striped pattern, and simply scribbled freehand on a few! Before coloring your eggs, wrap several rubber bands around the width and/or height of the eggs in varying thicknesses. Once wrapped, color your eggs and allow them to dry completely. Remove the rubber bands and you’ve got some cool Easter eggs! The white stripes left behind after the eggs have dried and the bands have been removed offer a cool modern look to this classic Easter accessory. If you’re brave enough arm the kids with some glue and glitter, then let them bedazzle their Easter eggs! Sparkly and shimmery colors are sure to glamorize any basket. It’s not all about dye! Gather the family around the table (covered in plastic, of course) and hand everyone a paint brush as well as a melange of pretty spring colours. Give the family a chance to release their inner Picassos. You can create a range of geometric shapes on an egg with the use of electric or painter’s tape. Cut strips in varying widths to impart a contemporary design on your Easter gems. Give the kids some creativity and let them choose their shapes. Fuse together two separate colors with this creative trick: submerge the egg in one color until it’s completely dyed and dried. Next, prepare a second dye that is a shade darker and add in one tablespoon of oil; gently swirl the colored egg into the second mixture for a marbleized effect. 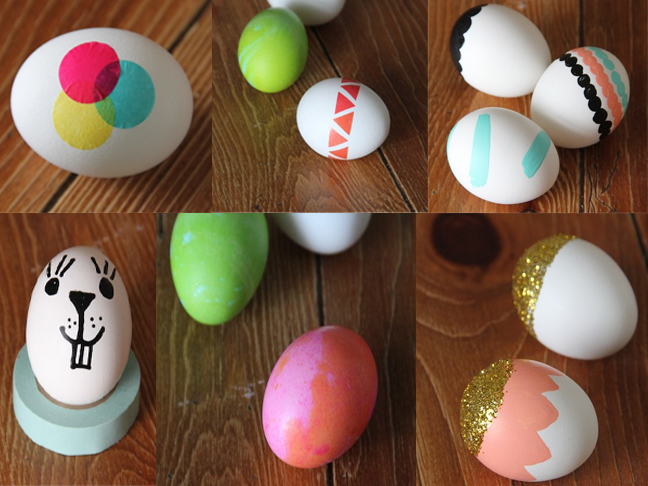 That art supply that every kid loves is also great for decorating Easter eggs! Use it to apply pictures that have been cut out of magazines or old books, or a colorful tissue paper design. No one will have eggs like these! Turn plain-colored eggs into whimsical animal characters, from chickens to bunny faces and more. There’s no limit to what you can create from your hardboiled blank canvas—the oblong shape is the perfect starting point for a festive animal egg.